Driverless cars within two years? Rupert Stadler, Audi's chair of the board of management, isbetting on it.In a wide-ranging chat, he talks future motoring with T3. T3: We've tested your Online Traffic Light Information System and it really works. But how much involvement is needed from the city's side to put this system in place? Mostly we see that it's about how to share data - because data is available - and how to get the access to traffic light systems. So we are testing that one here in Berlin, we already tested it three or four years ago in Ingolstadt with Project Travolution. Scientifically we got the feedback that we reduce fuel consumption and so CO2 emissions, we get a better wave of green lights for the customers and it was at that time for us worthwhile to dig deeper, and to see that, from the technological side, from the car side, it works. We are able to organise the data flow and we can communicate with traffic lights. As a car manufacturer, we will not solve the problems, we can only be a part of problem solving. Governments, politicians, infrastructure planners, they are all involved. I think with today's conference, we are getting a little closer to the real world and to the business cases. What are the key things you've learned over recent years from the Urban Future Awards? That our stakeholders are really starting to listen. We're coming much closer together in terms of what can we learn from each other but, for example, in the next two or three years each company will offer electromobility [all-electric cars], but the infrastructure is not prepared. As a whole in a holistic approach, it's not a good deal. When we are talking about laser scanners, sensors, camera technology, how to really operate this data, and come up with an offer of piloted driving, piloted parking – but the infrastructure of big parking lots is not prepared – then it's a bad deal. So I think, what we've learned in the last few years is that all the stakeholders are listening much more to each other and everybody is thinking what they can do to improve the state of the world, the quality of life, the security, the safety of big towns. Some mayors are getting integrated into their ideas, also. For example in Somerville in Boston. That is a very good signal because they are also on the decision front what to do in the next 10, 15, 20 years with their big city environment. On average, in Sao Paolo, a car customer is sitting four weeks of each year in traffic jams. Of course, in our discussion, we said, "Come on, we have sensor technology, we have camera technology, why shouldn't we offer a little bit more assistance to that customer, so this time that he's spending in traffic jams gets more value?" With the RS7 in Hochenheim we have piloted [autonomous] driving at 230kph. This is extreme, but this reflects to us what we, in terms of technology, can offer. With pure, piloted driving, the driver can take his hands off the steering wheel. He is liberated to do different things. To use it to do FaceTime with his customers, with his business, with his family. That way we create added value. When do you think that realistically will happen? This will happen, latest 2016. 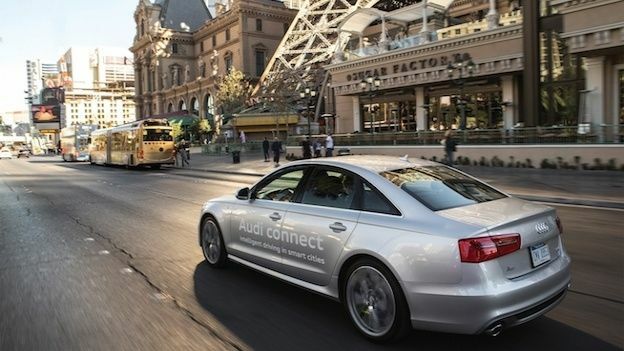 For the piloted driving, Audi is in the lead, and others will follow in one year or two years. The importance is that Audi is perceived as a progressive brand, that we really try to engage different stakeholders. And if others will benefit that's fine, that's okay. Where's the problem? All the technology that's being incorporated into cars – assisted braking, assisted parking, autonomous vehichle – seems to be distancing the driver from the driving experience. As a car manufacturer, is that a strange thing to do? I like driving, and looking to the future, I can see myself doing less and less driving. And if the experience of cars is the same: autonomous driving, how will you differentiate yourselves from the competition? The experience will not be the same. It will never be the same. Look for example, the difference of a plug-in hybrid, we get 50km [range] electric drive, so it's CO2 emission free. But on the other hand, on the highway, you kick down, you have a boost energy supported by the electric machine, this is sporty like it never was. So we try to combine things and try to create the best offer. And of course there is a big competition, this is for sure. But on the other hand, we will not avoid that from Redondo Beach, to Hollywood, the customer will sit one and a half hours in his car on the highway and he's stuck in the middle. He's stuck in traffic and this is fact. And there are only a few alternatives in Los Angeles. The bus system is not existing, there's not a subway system really existing, so the customer is obliged to take the car and we will give the best offer. And there is a moment, where you get the best sound quality from Bang & Olufsen (when you're sitting in your car, like in a concert hall), and in a different moment when the streets are free, then you can push a little bit, the pedal and you can have fun. It's always clear, the driver has the responsibility, we try to assist him. But is the future of driving less engagement for the driver, though? You know, the electronic stability programmes, which no one is talking about, but it's giving safety to the customer. And I think this is coming up. Maybe the younger generation, the generation Y and generation Z is looking much more to what level of connectivity do I have on board? How can I commute with my peer group? Because the moment of mobility is different in ten years or in 15 years. And the most important thing is that we open up our brain and our mind and try and see and learn what's happening outside. And then you can give the best influence to your product development, to have just in time or earlier than the competitors the right offer. Are you trying to place Audi, and motoring in general, at the heart of city decision-making regarding transpor? Is this a way to ensure that Audi, and cars in central, stay at the heart of cities? Restrictions and congestion will not improve the quality of life for the customers. Because the customer will want to live in the centre of the city, the customer wants to be mobile and the question is only how can we organise the mobility in the city? And one part could be car sharing, the other part could be a premium offer. And different things mean we will have to be organised and connected in a maximum way. And this is the pulse and this is what we aim for. For us, as car guys, we have to understand the DNA of a city. And if we understand the DNA of a city and decode it, then we are in the driver's seat to organise our business models – what could be our offer? An intelligent offer for our premium customers, and this is what it's all about. Is there a serious political barrier for a company like Audi to come in and say, "We can create the infrastructure which will overnight make all these things completely possible"? Can you see any advantage in car companies getting together to put systems in place? No. There will be nothing happen overnight, believe me. How to change the infrastructure in a city like Berlin? We should not be naïve, this is a process of 10, 15, 20 years. And should private companies be in charge of city infrastructure? Of course, there are public and private partnerships when it comes to car parks, when it comes to whatever. This game is open. But finally, what we have to learn about what is the price of the currency for that added value? Of course, this will take time. But who's interest is it to build that infrastructure, if it's only your cars that benefit? If people don't want to spend their money here in this city, then the mayor has no income, so there is, from all the sides, a key interest. Where is the technology with regards to hammering standards out with the other companies? There is no monopoly situation. I think it is an open source, and I think there will be created some standouts, that's for sure. Do you think there'll still be private cars in "ideal cities" 20 years from now? I could not imagine that the citizens, who want to live in the centre of the city, park their car 10km outside of the city and accept only public transportation. I think we are entering into a very complex form of mobility, and believe me, there will be private, premium mobility, there will be different modes of interconnected mobility, with public infrastructures and there will be a certain kind of shared mobility, this is for sure. But to exclude the one or the other, will not happen. I think we should aim to optimise the mobility flow. This does not mean we'll sell less cars or more cars. This is not the matter of the game. The question is, what do we see in 20 years or 30 years? And this will be very much different forms of mobility. But if we look at forecasts, Germany predicts a virtually static market: no growth. Because it's a very mature market. In 1,000 people there are 500 car owners. In China for every 1,000 people you have 150, so this is a different world, of course. You cannot unify everybody and everyone. Your two closest rivals, Mercedes and BMW are actively engaged in car sharing. Are you going to join in? We already joined in! We see car sharing from a different angle: a premium perspective. For example, the “Audi Unite” concept [a scheme, available in Stockholm where five people share one Audi] is a certain kind of car sharing, but we are entering into specific peer groups where we see there is premium business. Car sharing, this can be done by Budget and by Rentacar, this is easy, but a little bit more related to flat fee business. We, as a premium automotive company, we thought through that concept. And with Audi Select and Audi Unite, and what will come in the future, we think we are very close to our customer group. We provide additional value and additional services and this is important. In the big cities, car sharing, seamless mobility will anyhow start and operate. The only question is what is our part, and our story in that business? And we define it in a little bit of a different way. But I think in a valuable way. Do you think Drive Now is losing money for BMW? I couldn't answer the questions, about what BMW's business is doing right now. Everyone's looking for the right business case, because only if the business case is running well, you are happy and you're able to reinvest.